So much of the HS2 debate is loud, shouty and not very revealing, with fixed positions and closed minds. As such it is no surprise that the combatants missed the huge Thames Hub proposal and how it affects HS2. Thames Hub is a proposal from Fosters, Halcrow and Volterra to utterly transform infrastructure in the UK. Unlike some previous plans, it is highly persuasive because of the sheer number of infrastructure problems it tackles. Not content with a new high speed line, the proposal links in freight traffic. There are huge container ports in the Thames estuary and not enough capacity on the railways to transport them. As such, there are far more lorries on the road than there need to be. 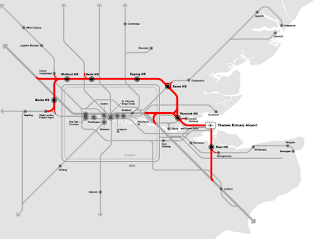 The proposal suggests that the new railway line around the M25 would be 4 track, with significant freight capacity. As part of the railway line, a conduit would be built to transport broadband and electricity. This removes miles of pylons from the countryside, surely a clear benefit. The potential closure (or major downgrading) of Heathrow would also relase more land for development. Other cities have moved their primary airport in the past, including Paris (1974), Munich (1992), Denver (1995), Oslo (1998), Hong Kong (1998), Kuala Lumpur (1998), Athens (2001), Bangkok (2006). The sheer scope of the plan is breathtaking and would be utterly transformative for the UK. The land for the airport itself is somewhere I've actually been too, a number of years ago. It is land of no great landscape quality and entirely suitable for change. Two villages would be destroyed, but with suitable generous compensation I believe that to be acceptable. There is a concern over birds, especially with aircraft, however this is something that can be overcome if the will is there. As I always say, its important to look at the alternatives. Heathrow is full and overflowing with just 2 runways (and no longer any possibility of a third), when Paris, Amsterdam, Frankfurt and Madrid all have at least 4 runways at their airports. It has always been in the wrong location for London as it requires planes to land over the heads of 7 million people. Heathrow simply cannot expand. Gatwick, Stansted and Luton each have just one runway. Each one could be expanded, however doing so would face larger opposition than the estuary as planes would fly over more people. And its important to consider that one of the three would need three new runways adding to reach the four necessary for a UK hub. Another approach is "Heathwick". 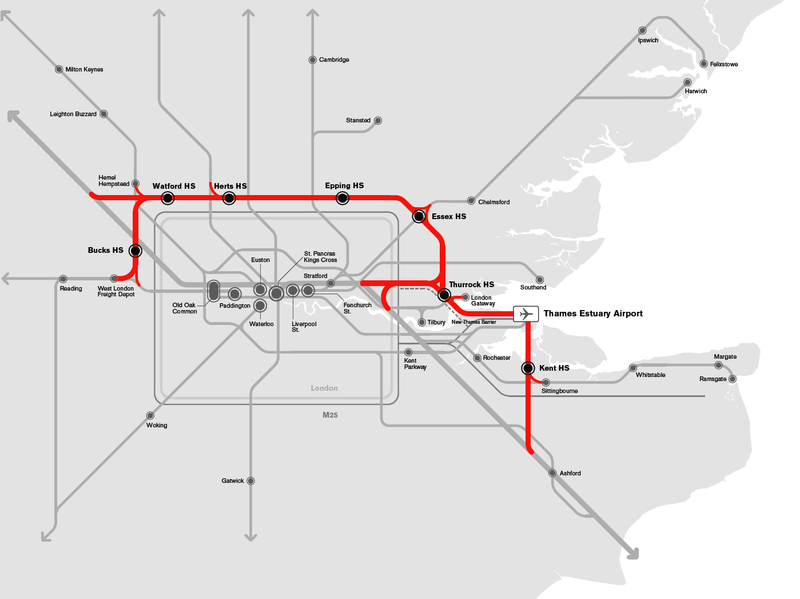 This would link Heathrow and Gatwick with a fast rail line is essentially linking the worlds busiest single runway airport (Gatwick) to what is probably the worlds busiest two runway airport (Heathrow). Clearly that solves nothing. The "spread" approach entails linking perhaps four or five airports (probably including Birmingham via HS2) to create some form of virtual hub. This appears to me to be the classic 'make do and mend' fudge approach. Bear in mind that Birmingham only has one runway. Finally, there are, and have been, other plans for the estuary, including a site close by at Cliffe and a floating island further out. The principal difference to Thames Hub with these is the detail in the supporting proposals, including all the other infrastructure effects. Looking at the alternatives, I think Thames Hub must be considered a viable option, and perhaps the best, since creating a four runway airport at Luton or Stansted seems unlikely. But the big impact here is on HS2. As I covered in my last blog, the HS2 route has been hugely influenced by a need to go "somewhere near Heathrow". 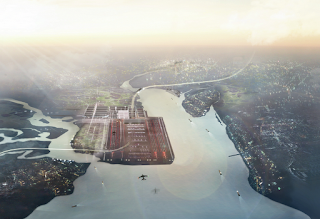 But the Thames Hub plans talk about closing Heathrow, or downgrading it to budget airline status! It is patently nonsense to let "somewhere near Heathrow" dictate the route of HS2 when it is uncertain that Heathrow will survive in its current form. It is utterly essential for Government and politicians to decide on airport policy before deciding on the HS2 route. After all, if the "somewhere near Heathrow" constraint is removed, then the M1 route of HC-Midland suddenly looks far more sensible. You say that that the area is of NO LANDSCAPE QUALITY, but what you forget is that this is our home. You want to knock down our homes and our childrens schools. Where are we mean'nt to go as so many other local towns are also going to be affected. @Anonymous, While I don't envy your situation we really do need to have the national debate on airport/infrastructure policy, something which is definitely constraining future UK growth (and this blog is part of that debate). In another forum I called on the Government to decide on Thames Hub quickly, so you can have certainty. I also called in the blog above for generous compensation, enough to secure you a new start elsewhere. @ Stephen Colebourne, its ok for the people that are sitting in there lovely offices making these decisions about OUR HOMES, after all they don't live here do they. I for one don't want too move and my children don't want too either.We are going to have too move so far away as not to still be effected by this planned airport. Im sure no one thinks of the effect this will have on us and our children, all having to move to new school, thats if there are enough spaces to school them. And what about us that have jobs here, are you going to guarantee us all a job too??? Whilst I appreciate that feelings run high over any matters that affect our homes & lifestyle I would like to know the answer to one thing: What is the price for like for like? For example - If I am going to be paid money to ensure that I can "start again" as you put it, will the money be able to afford me a 3 bed home with the same quality as I now have because I have spent thousands of pounds on my home? Will the money get me a home with acres of green space to walk my dogs? Will it give me miles of beaches? Will it give the villagers the same safety that we have now so that our children can play all day without any fear from the usual problems that affect most towns? Will the money mean that all friends & family members stay together so that the community is not lost? What about losing the special scientific areas that we have, the protected wildlife, flora & fauna; will that be dug up & moved with us? I think not. So to "start again" will NOT be anything like we have now. Therefore anyone who thinks we can just move & carry on is sorely mistaken. Life would never be the same again. Hearts will be broken, reationships will be broken both adults & children, communities will be broken. What price is right for that??? @Anonymouses, Firstly, I'm an independent commentator with an opinion, thats all. As such, I have the luxury of being able to ask the question of where the trade off lies for the UK as a whole. Should we help the 5 million people who live with daily noise and pollution of aircraft in London and the 60 million people in the economy constrained by a lack of access to foreign markets, or protect the 5000 people directly affected on the Isle of Grain? From your perspective the answer may be clear, but nationally it is a fair question to ask. On jobs, I'd note that Crawley near Gatwick airport has consistently had low unemployment. Airports employ huge numbers of people in a variety of jobs. On compensation, I would want to see you to get *considerably* above the market value of your property - I would not consider it an acceptable scheme unless you did. Of course money doesn't solve all the issues, and you rightly raise some of them. As somebody who moved out of London after the huge development of City airport - all of a sudden, we were under two heavy flight paths instead of a heavy one (to Heathrow) and a light one (to City Airport) - I am all too aware of the "not in my backyard" kneejerk reaction we all have. Sure, *ideally*, it would be great if we could set up a new airport in a practical location and no villages were affected but in practice, we all know it is going to be impossible so we have to look at numbers - the smallest number of people affected, the easiest it is to offer them real compensation that includes other costs besides the value of their property. South East Londoners didn't get any compensation when City Airport started increasing its number of flights, yet, many of us were affected and I know many people for whom it was the last straw. Still, we didn't get any compensation because it wouldn't be feasible to compensate millions of people. So this is why the total number of people affected is such an important factor, both to minimise the number of people whose lives will be affected and to maximise the comfort and easiness of changes for those who are affected by providing them with an adequate compensation. For those complaining about a new airport affecting them, I assume you and your fellow villagers have never caught a flight from any of the London airports and therefore have never participated in the air traffic that affects millions of people on a daily basis? @Anonymous. You are what we call a NIMBY and Nimbys are selfish.